Renewable energy, produced from renewable resources such as solar radiation, wind, water currents and geothermal heat, is a fast-growing industry. Within the renewable energy sector, there are a wide variety of materials-based problems in which researchers are generally seeking to boost efficiency, lower cost and possibly weight, or utilize some previously under-utilized resource. One area of the renewable energy market that is currently garnering attention is photovoltaics (PV), which are materials that absorb and convert solar radiation into electrical current or voltage. Photovoltaics are specialized semiconductor materials, while the complete photovoltaic assemblies are generally a multi-layer device comprised of electrical contact layers and other layers to optimize performance or protect the device from environmental exposure. Analysis techniques such as EDS, EBSD and Micro/small spot-XRF are important in enabling researchers to understand the chemical and crystallographic structure of materials and how they can be modified to maximize performance and minimize cost. 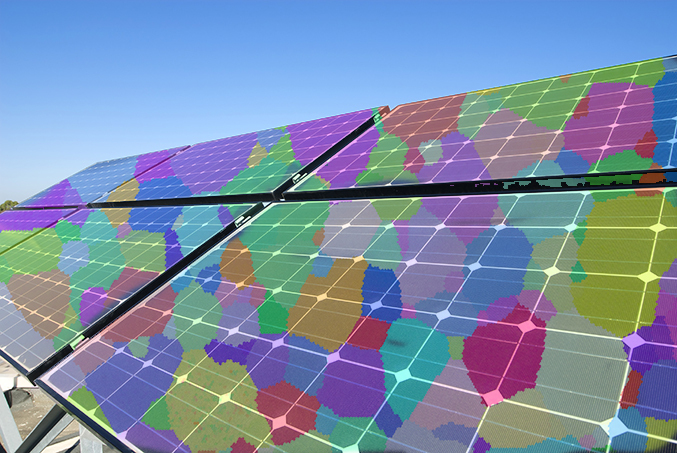 Certain characteristics such as composition, layer thickness, and grain size and microstructure have tremendous impacts on the quality and efficiency of solar products. Microanalysis techniques are used to study microstructural characteristics and refine the recipes and processes to optimize photovoltaic materials. EDS is also used to study the effect of the environment on the solar products in use to determine how contaminants and wear and tear degrade the solar converting material. Micro/small-spot XRF is used to determine the composition of photovoltaics, particularly dopant levels, as this directly impacts device performance, as well as device layer thickness. Due to the growing demand for renewable energy sources, the manufacture of solar cells and photovoltaic arrays has advanced considerably in recent years. Another new promising technology is fuel cells. A fuel cell is an electrochemical cell that converts energy from a fuel such as hydrogen molecules into electrical energy. Electricity is generated from the reaction between a fuel supply and an oxidizing agent. Fuel cells are very useful as power sources in remote locations, such as spacecraft, remote weather stations, large parks, rural locations, and in certain military applications. A fuel cell system running on hydrogen can be compact and lightweight, and have no major moving parts. A wide variety of materials are used to achieve optimal and reliable performance. The chemical composition is studied with EDS and the grain microstructure is studied with EBSD, making combined techniques a valuable analytical tool for this field. Micro/small-spot XRF is used to study defects in catalyst and isolating layers, which lead to shortened cell life.